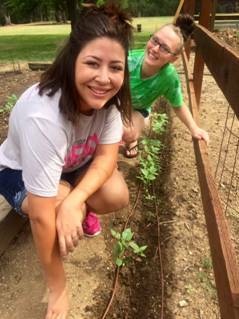 Last Saturday, the Sacramento Mercy residents got their green thumbs dirty on a visit to Fox Lane Garden. The residents regularly visit Fox Lane to help plant and tend to produce that is eventually donated to Placer Food Bank. Fox Lane Garden has been in production for the last three years. 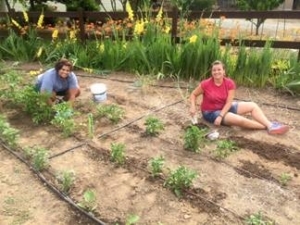 Over 200 plants are grown from seeds in the 2,500 square foot garden owned and operated by Mona Bass. Ninety percent of the produce grown is given to local Placer Food Bank agencies in Lincoln, California. Last year, 600 pounds of produce was donated. “I believe in sustainable living and giving,” said Bass. In addition to a food source for the less fortunate, Bass uses the garden as an opportunity to teach. 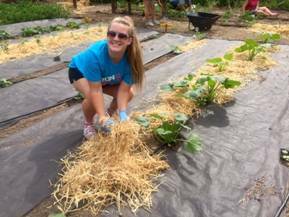 She invites Mercy residents and local Girl Scout troops to help take care of the garden and teach them about God’s gift of nature. “It is fun to take these garden lessons from nature and apply to our lives,” Bass said. Bass used this time to share with the residents biblically based analogies of how God plants seeds in our lives and trusts us to tend to them. She shared that He is active in all of His creation and loves to be in the business of growing and nurturing. Mercy Multiplied is grateful for Bass’ partnership and the life skills she teaches at Fox Lane Garden. Click here to learn how you or your organization can partner with Mercy and support young women as they break free from their life-controlling issues.